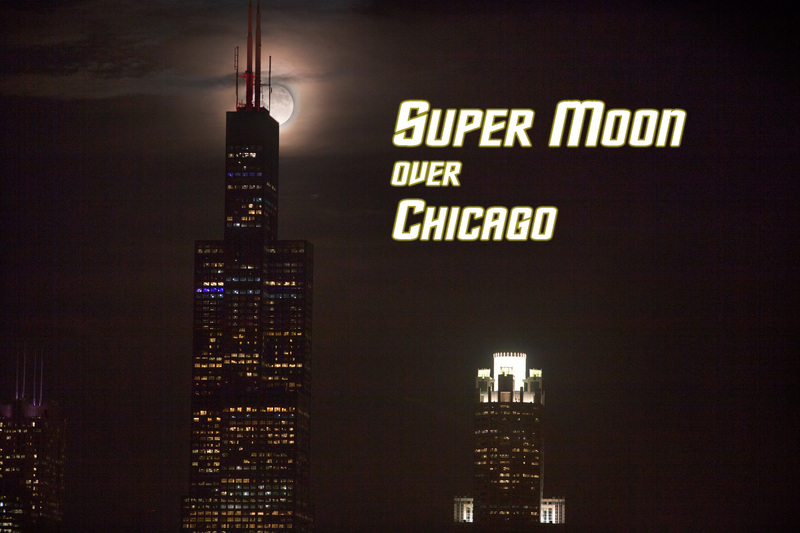 Sure it’s been awhile since the Super Moon rose up over Chicago, but when I was photographing it I had an idea last minute idea for a time lapse video and I’m just now getting around to doing it. What you’re seeing is actually a collection of about 140 photos stitched together in two different ways and then made in to a short video. With a little more forethought I might have been able to create something a little nicer, but considering this was a first attempt at this technique I’m mildly happy with the results. Watch the video then I’ll explain below the short version of how I did it. So if you know anything photography, chances are you have to adjust your camera to compensate for light, or lack of light. With the moon basically being a large white object that is getting direct sun light, you’re essentially photographing an subject matter that is out on a sunny day. You’re photo after all is a direct result of light reflecting off of an object. So no matter how good your camera is, when the sun has set and is no longer shining on the objects you want to photograph that are in front of the moon (buildings, ground, sky, so on…) you’re going to have to pick between the moon having detail, or your foreground showing up. See the 3 photos below as an example. The first image you can see the light sin the building, but the moon is just a bright white light. 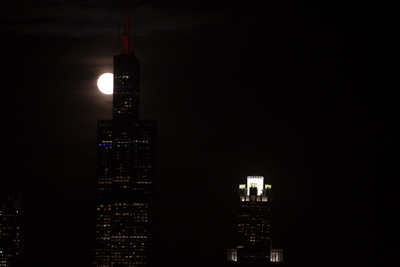 The second image, the moon looks perfect, but you can’t really make anything else out. So what I did was a technique photographers call bracketing. Which is where you set your camera to take 3-7 photos in order that range from being over & under exposed to where you want your photo. The ideal setting would have one the under exposed frame capture the moon at it’s best light and the most over exposed frame getting just some hints of the night sky and other faintly lit objects, with the middle frames getting the buildings and other lit objects in different states of light & dark. Once you have the set of images you can layer them on top of each other and create a composite image that shows the best lighting for all 3-5 frames. This process can also be done via an HDR (high Dynamic range) process, which is actually what I choose to do with the time lapse since I was working with multiple photos. So once I processed the 140 or some bracketed frames in roughly 46 new HDR images I placed them in a time lapse sequence and you get the time lapse video I showed up above as a result.